Check out my recent interview for The Balance Project. You'll see why I don't think everyone is cut out to be an entrepreneur and discover my favorite time management tool. The Balance Project is a recurring interview series that features fun, brief, relevant, informative, and refreshingly candid interviews with inspiring and accomplished women who are in the midst of trying to balance work, life, and, for some, kids as well. Writer Susie Schnall has published over 100 interviews so far! A few of my favorites are those with entrepreneurs including Sara Blakely who founded SPANX, Anita Shepherd who founded Anita’s Yogurt (it's made in Brooklyn and vegan), and Institute for Integrative Nutrition grad Adina Grigore who founded S.W. Basics (a super natural skincare line, also made in Brooklyn). 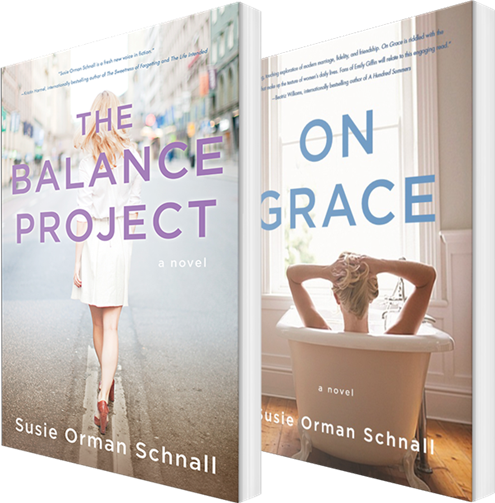 The project ties into one of the main themes of Susie's first novel On Grace as the main character tries to find her own balance upon turning 40 and re-entering the work force. It’s also the theme of her second novel The Balance Project: A Novel which was inspired by the interview series and has been called The Devil Wears Prada meets a fictional Lean In.